Wheaton Drama a ‘Best of Wheaton’ winner! For the second time in four years, Wheaton Drama has been recognized as a leader in the arts field, winning a “Best of Wheaton” award. Grabbing top honors as the Wheaton Chamber of Commerce’s Not For Profit Arts Organization of the Year, Wheaton Drama continues its 85-year tradition of excellence in entertaining and enlightening members of its community. Wheaton Drama rounds out its 2016-17 season with John Patrick Shanley’s newest romantic comedy, “Outside Mullingar” (running March 24 through April 15), and Mel Brooks’ hilarious musical comedy “The Producers” (running May 26 through June 18). See why our audiences and the community at large agree that Wheaton Drama leads the pack in providing professional-caliber theater with a familiar touch. Posted in Theater, WDI Events, Wheaton Events | Comments Off on Wheaton Drama a ‘Best of Wheaton’ winner! Help us win ‘Best of Wheaton’ honors! Wheaton Drama has been nominated for a 2017 Best of Wheaton Award in the category of “Not for Profit Arts Organization.” In 2014 we won this honor, due in large part to the direct support of our members and community supporters. We hope we can count on you to do the same for us this year. 2.) 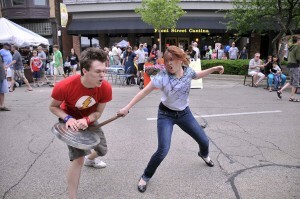 Click on the “Best of Wheaton” banner. NOTE: You may cast one vote per email address per day. That means if you have three different email addresses, you can vote three times each day. VOTE EARLY … VOTE DAILY … VOTE OFTEN. Posted in Theater, WDI Events, Wheaton Events | Comments Off on Help us win ‘Best of Wheaton’ honors! Wheaton Drama has been nominated for a 2014 Best of Wheaton award. Please vote for this renowned theater by logging on to www.wheatonchamber.com and voting for Wheaton Drama under the category Not For Profit Arts & Community Enrichment Organization. One vote per email address per day will be honored. Voting ends Monday, Feb. 24, at midnight. Please help Wheaton Drama achieve this distinguished honor. Vote today and every day through Feb. 24. 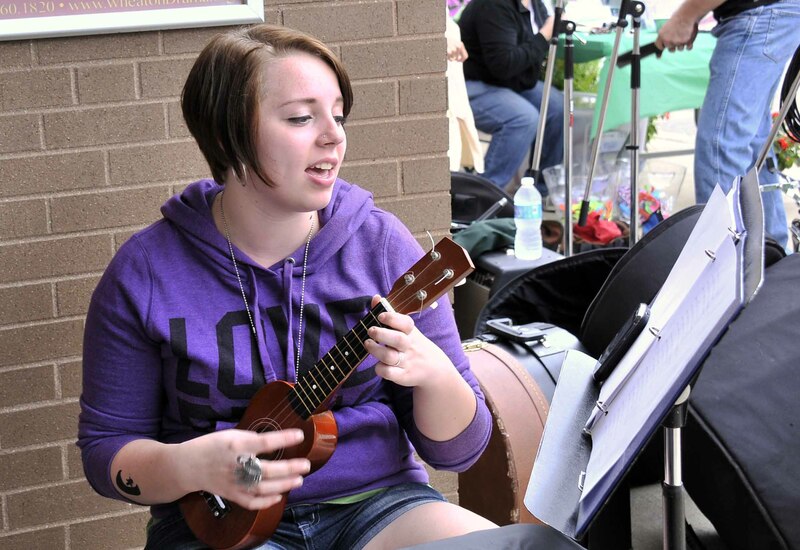 Juggling, dancing, showcasing stage combat from the upcoming studio show, and playing musical instruments were just some of the activities Wheaton Drama members participated in during the Taste of Wheaton the first Saturday in June. 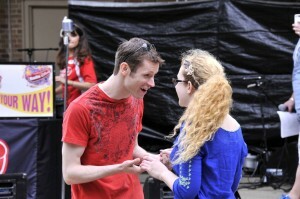 The cast and crew of this summer’s studio show, Romeo & Juliet, entertained audiences and handed out show materials. Here are Steven Merkel’s photos from the day. 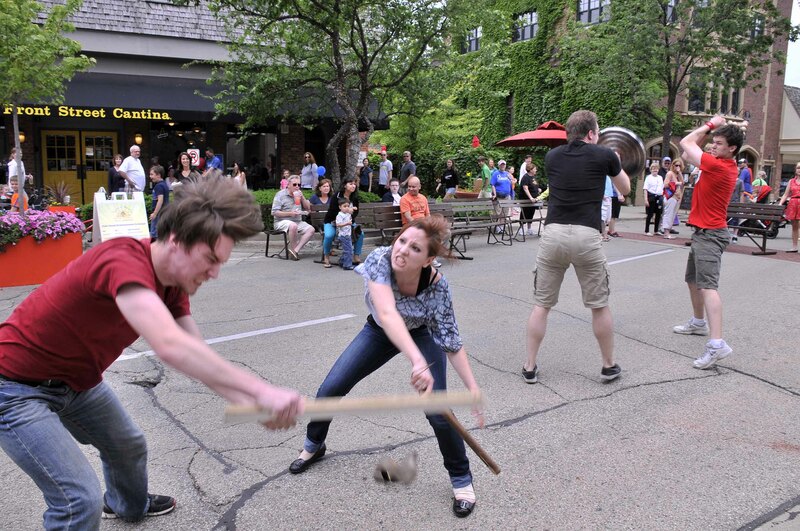 John Trygstad and Katheryn Pucillo show that the Montague/Capulet feud is not to be trifled with in the upcoming studio production of “Romeo & Juliet”. 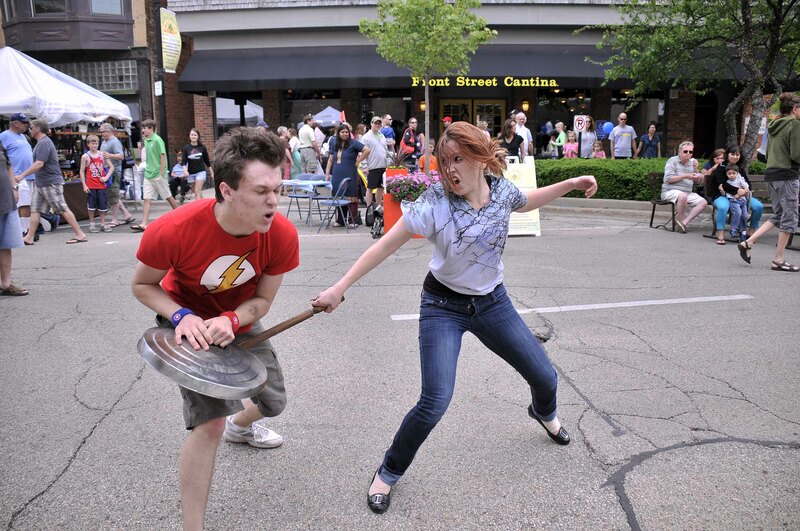 Some of the show’s stage combat was showcased during the Taste of Wheaton. 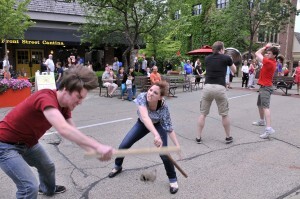 John Trygstad and Katheryn Pucillo of “Romeo & Juliet” fight for the Taste of Wheaton crowd. 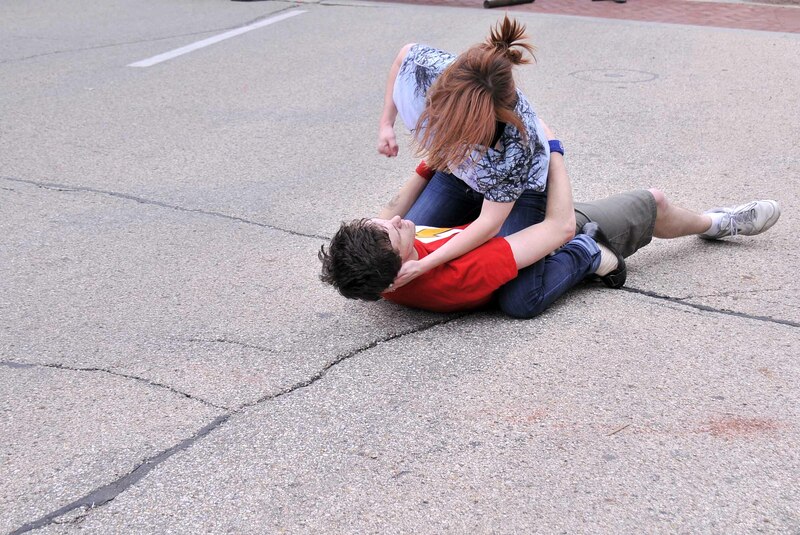 Dan Stromquist and Katheryn Pucillo demonstrate a section of the Montague/Capulet fight from “Romeo & Juliet” outside Playhouse 111 at the Taste of Wheaton. 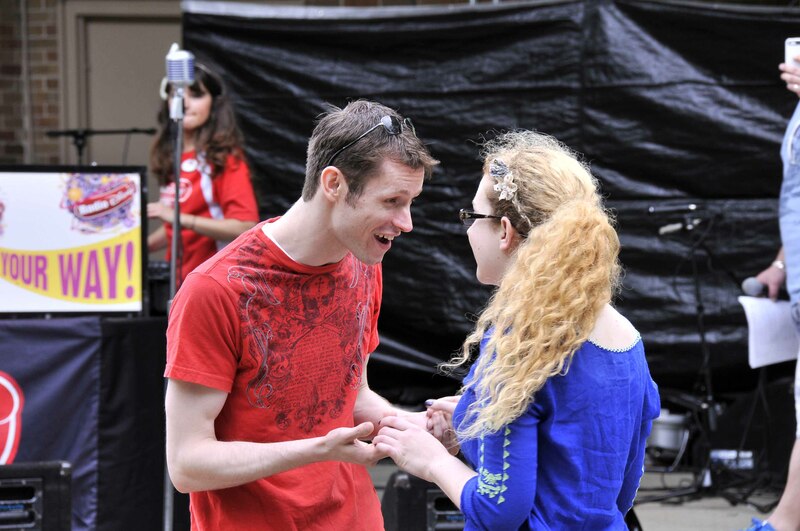 Garrett Ard (Romeo) and Nikki Wilson (Juliet) perform the titular characters’ meeting during the R&J flashmob at the Taste of Wheaton. 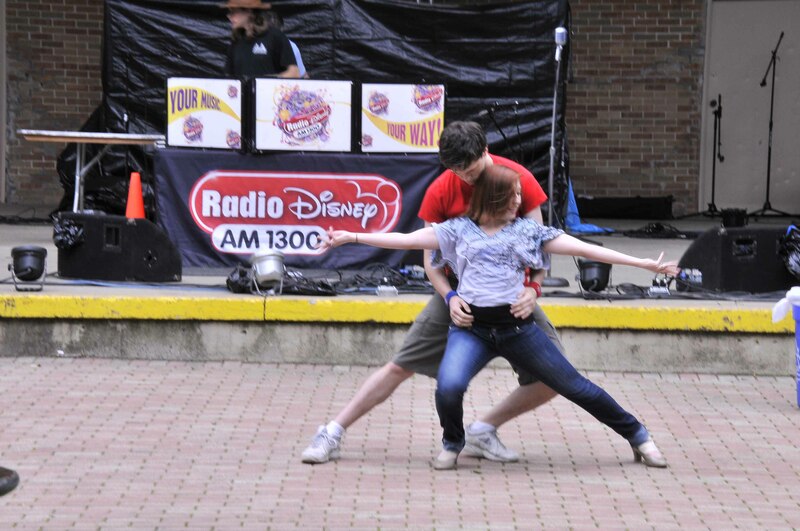 John Trygstad (Abraham) and Katheryn Pucillo (Gloria in “Romeo & Juliet”) participate in the R&J flashmob at the Taste of Wheaton. 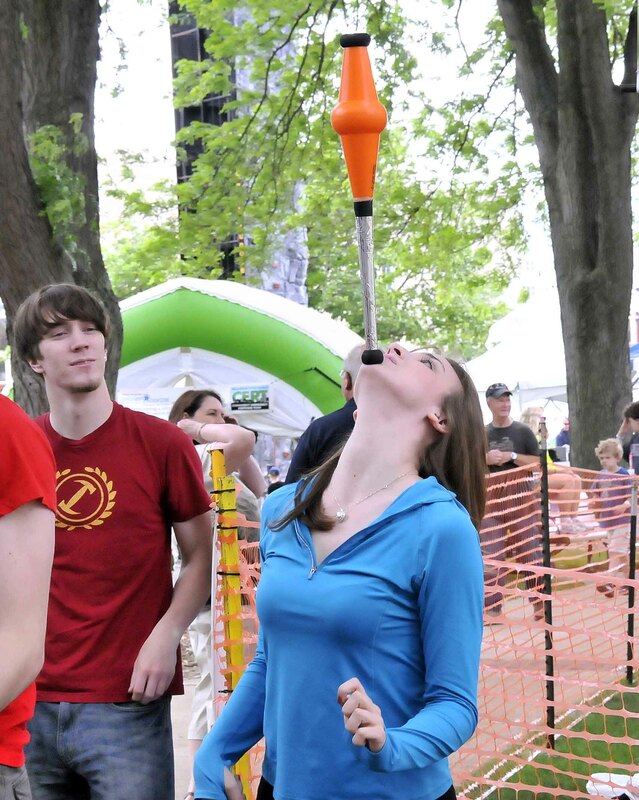 Emma Gotter (Rosaline in “Romeo & Juliet”) shows off her balancing skills as Dan Stromquist (Balthasar in “Romeo & Juliet”) watches during the Taste of Wheaton. Katie Kanturek (Street Performer/Friend to Juliet in “Romeo & Juliet”) plays for the audience outside Playhouse 111 during the Taste of Wheaton. 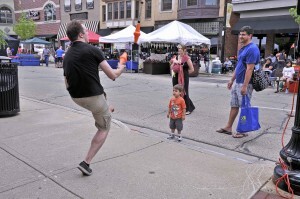 Andrew Trygstad (Mercutio in “Romeo & Juliet”) juggles for Taste of Wheaton visitors. Performances of Romeo & Juliet are June 28 at 8pm, June 29 at 8pm, June 30 at 3pm, July 5 at 8pm, July 6 at 8pm, and July 7 at 3pm at Playhouse 111. Tickets are $10 each. Seating is General Admission. This show contains mature themes and stage combat. You are currently browsing the archives for the Wheaton Events category.